Polly Gibbons is a contemporary artist living in South Surrey. She has a BSc in Psychology from the University of Washington and a BFA in Visual Art from Emily Carr. Polly is incredibly thoughtful and methodical in her work. 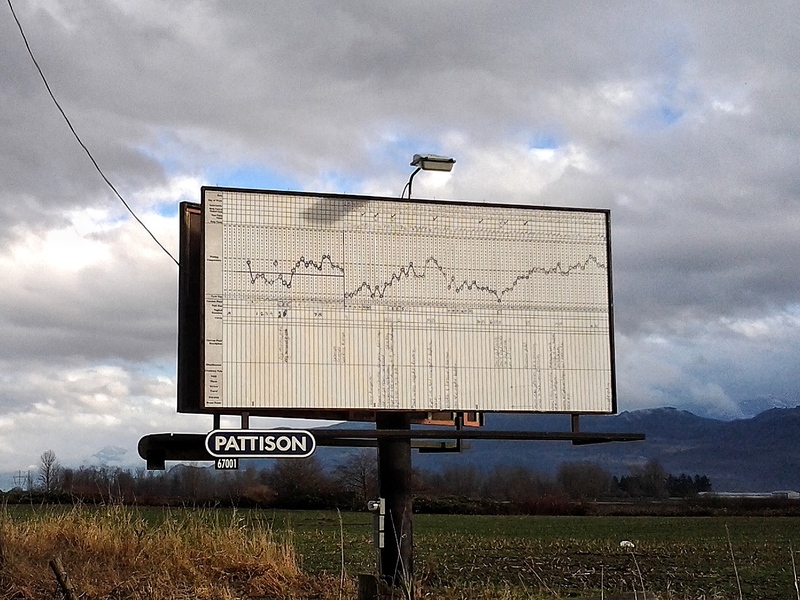 For Advertising Fertility (halfway to hope) (2012), Polly rented a highway billboard and mounted an enlargement of one of her basal body temperature charts. This is a type of graphing that maps ovulation cycles and finds optimum times in the month to conceive. Through this work, Polly was responding to a psychology article she read that claimed humans are one of two species who do not advertise their fertility. By placing the work in prominent commercial space, Polly not only challenges this thesis, but reflects on how we neglect to listen to the ways our bodies speak to us. Polly is also a prolific instagrammer. You can find her under @pollygibbons. SOFIA/c: How do you describe your own art practice? Polly: I describe myself as a contemporary conceptual artist, because if I just say I am an artist people think I am a painter and I’m not a painter. Then people ask, “Well, what does that mean?” and then I explain. My work is driven by an idea. A concept. And whatever medium I have to employ to get that concept across, I will. If it’s something I don’t know about, I’ll learn about. Or I could get someone else to do it for me. But the idea is the important part. SOFIA/c: Why are you interested in engaging contemporary art and community in Surrey? Polly: One reason is I don’t think people understand what a contemporary artist is, so I love getting the chance to explain that to people. There are some people who think they know what it is, but they have certain disdain for it. So I would like to convince them that it is not really a disdainful activity. There is this sense that it’s the emperor’s new clothes. So I try to explain to people by showing what I am working on. I show that I’m very committed to it. I do a lot of research. I work really hard at what I do, and it’s not the emperor’s new clothes. SOFIA/c: Are you referring to the work being accessible? Polly: Well, with the billboard, since I was documenting it each day, I met people while I was out there. I met the farmers there, so I explained what the project was about. And they thought it was cool. Soon we were talking about their cows, because it’s a dairy farm, and they were talking about the fertility of their cows. And I went to the Sumas First Nation, because it was on their land and I wanted it to be okay that it was up there. When I was talking with them about this piece, it just got us talking about our own stories of fertility. And so it became a way to talk to people about things that maybe I wouldn’t usually talk to them about. 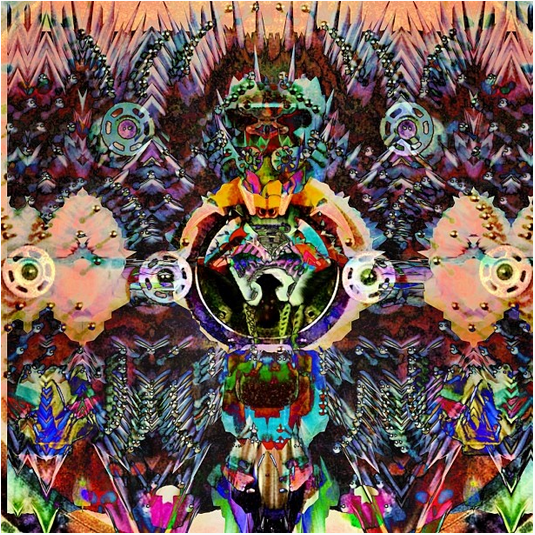 SOFIA/c: What role does your digital art play in your work? I actually see what I’m doing on Instagram as a giant digital playground. I can test out ideas and images and get an immediate response. It also gives immediate feedback on people’s aesthetic preferences. It has also been a great way to learn digital editing techniques and practice writing. Plus, it’s given me a window to people and places all over the world. There is an immediacy to it in terms of the themes and imagery that people are interested in that can’t be matched by the traditional gallery or museum system. I started working digitally only very recently, as I learned analog photography when studying at Emily Carr. Instagram became the driving force in my use of digital imagery and iPad apps for doing edits. 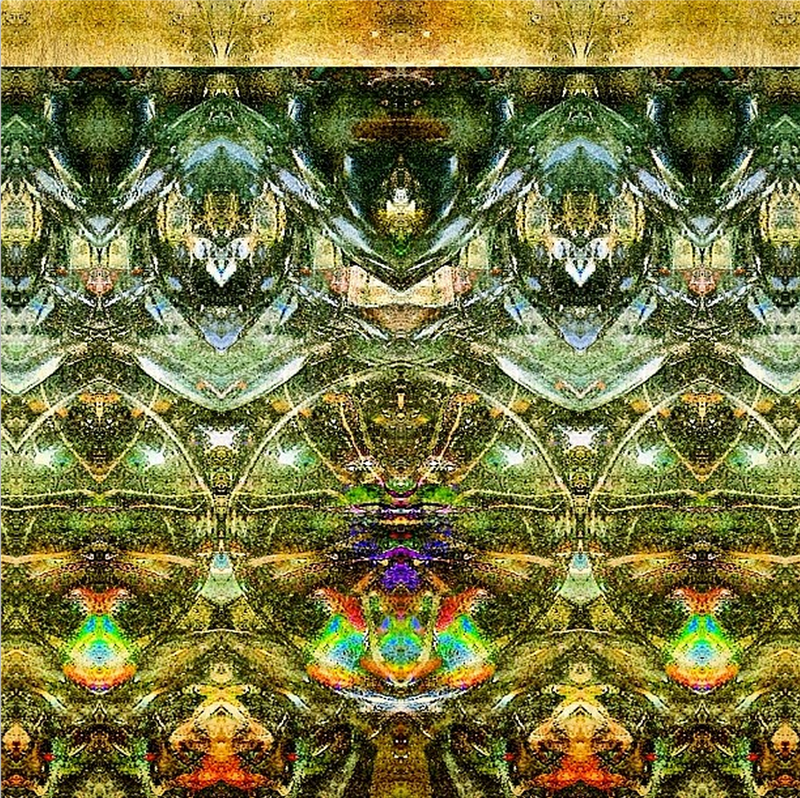 Another example of Polly’s “collab edits” (short for collaborative), where more than one person is involved in the creation of the final image. The original image was created by Darrell Dean (@tikin4u) and was chosen by Silvia Ittensohn (@silvia_ittensohn). By working in a series, Polly shows her progression in manipulating an image through various stages. SOFIA/c: What is your favourite place in Surrey to find creative inspiration? Polly: The Nicomekl River. When we first moved out here, we would drive over the river as we were coming home. My daughter was 2 and a half, and every time we would ask her, “Do you know where we are? What river are we crossing?” and she would just say, “Nicomekl.” And it was this amazing thing that she could say. She couldn’t say a lot of other stuff, but she could say that. And we live right by the river, and it changes throughout the seasons. So I love going there and seeing it during the different times of year, different times of day. It’s an amazing place to see the sun set. 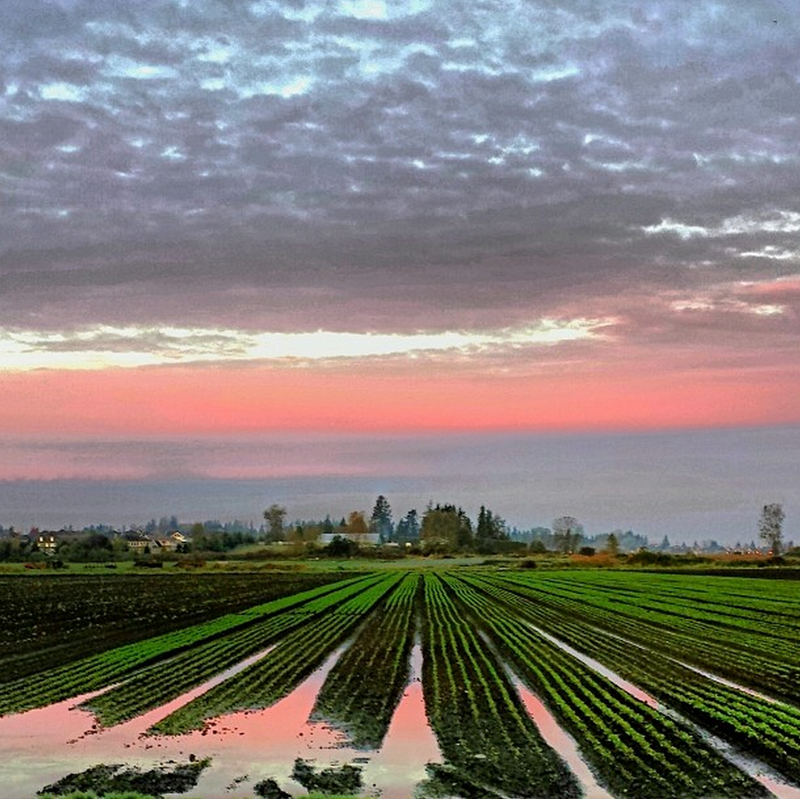 An instagram’d shot of a waterlogged field in South Surrey. 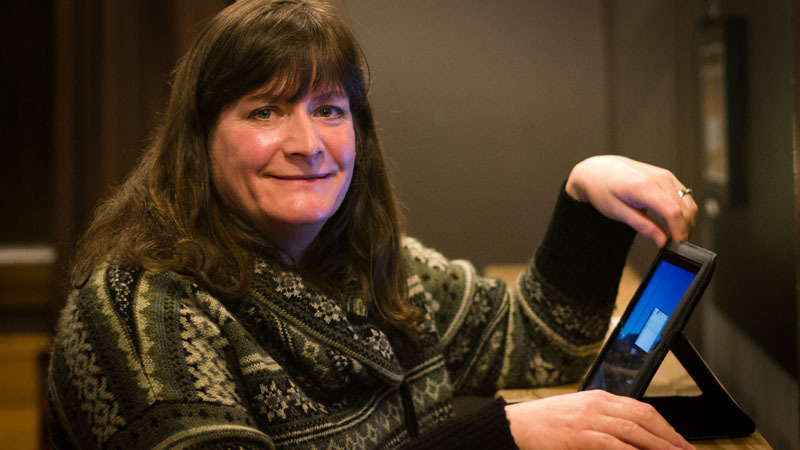 Having raised her kids alongside the same neighbours for the past 10 years, Polly feels strongly connected to her community here. We are so pleased to have Polly join us. If you are interested in becoming involved with SOFIA/c, write to us from our contact page. Stay tuned for another profile in the New Year!